One of the moments of pure joy during the making of our book was finding Eric Beyer's cache of rare and treasured surfboards at Beach House Classic Surf Shop in Bay Head, New Jersey. We've already shared the stories he told us for his Michael's Fremont double-ender egg, and his beautiful blue G&S with the original fin. In the final installment of this series, we're very excited to share the story of this 7'6" rounded pintail Lightning Bolt. Over to Eric. "Lightning Bolt Surfboards got its start during the shortboard revolution. The company was founded in 1972 by Gerry Lopez and Jack Shipley, and by the end of the decade it had become the most iconic surfboard brand in existence. Known as “The most frequently tubed surfboards in the world”, the label dominated big waves line ups all around the globe. 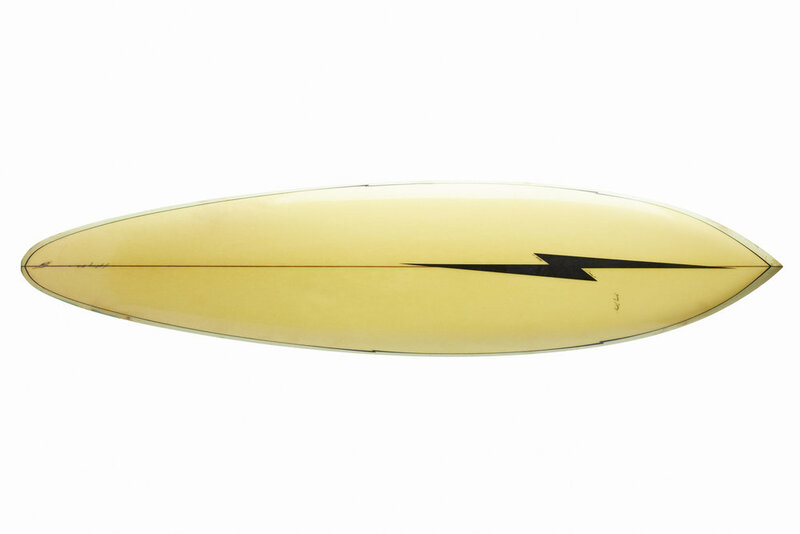 Lightning Bold boards were ridden by the best surfers from coast to coast." 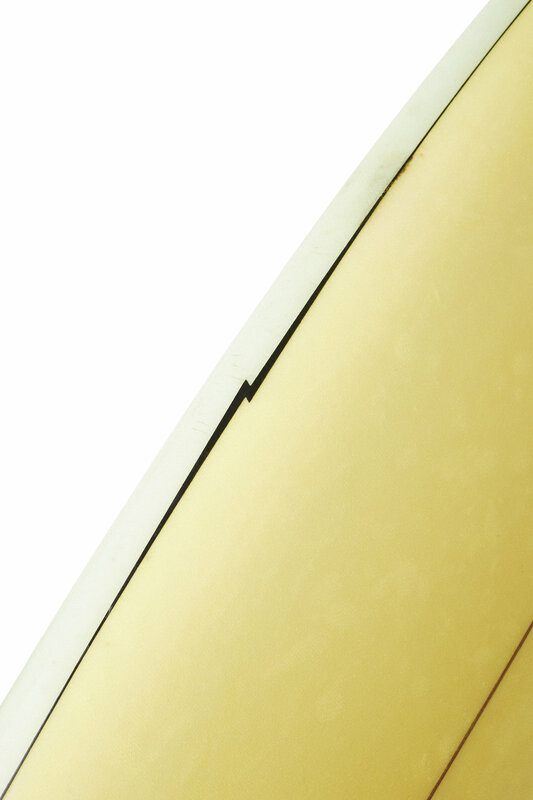 "This gem is an iconic 7’6” round pin barrel rider. It came to me as a trade in from a customer from Belmar late in the summer of 2003. He had stopped surfing because of a knee injury suffered in his mid 20s. When he brought it in, he told me stories of getting some serious hurricane surf at the L jetty in Avon as well as point breaks from Montauk to Point Judith, RI." "Later that fall, I got to ride it in some really nice overhead Bay Head South Swells and had a blast! It was super progressive considering its age. It really held in well, it was quick out off the bottom turn and caught waves like a dream. I was carrying Lightning Bolt surfboards shaped by Craig Hollingsworth at the time, so I figured I would give him a call." I told him about the board and he asked me a few questions. He wanted to figure out if Gerry Lopez had actually shaped it or not. Craig told me that based on the resin (not painted) bolt and the ultra-fine resin bolt pin-lines on the deck, one of Lopez's signature details, and the fact that "a pure source" was written along the bolt, it was almost certainly shaped by Mr. Pipeline himself. The capstone that confirmed his suspicion is that the signature is on the resin surface, not a laminate placed under the resin. It currently hangs on our shop’s ceiling above a painting of Lopez surfing Pipeline behind the counter." Huge props to Eric Beyer for sharing so many great stories and boards with us. If you get the chance, pop down to Bay Head and check out the store for yourself! Finally, we're very excited to let you know that we are now accepting pre-orders for our book Ice Cream Headaches: Surf Culture in New York & New Jersey. Grab your copy today!